Northern France; Late 15th Century. Latin Text; Gothic Script. Blooming on these leaves is a truly impressive variety of what Ege calls "wayside flowers," including thistles, gallic roses, strawberries, grapes, and others which are so stylized as to be nearly geometric. There are many well-executed illuminated initials; lesser first letters are filled with yellow. 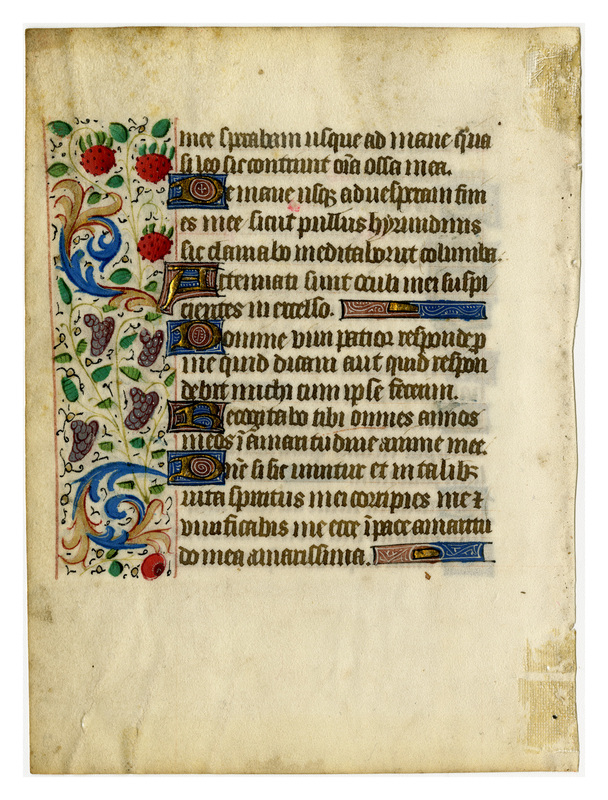 Occasionally a lone "cut flower" has been used to fill empty space in the text block. Verso Translation: [continues Isaiah 38] ... of me. I hope even until the morning: as a lion so hath he broken all my bones. From morning, until evening thou wilt make an end of me: as a young swallow, so will I cry, I will meditate as a dove. Mine eyes are weakened: looking up on high. Lord I suffer violence, answer for me: what shall I say or what shall he answer me, whereas myself have done it? I will recount all my years: in the bitterness of my soul. Lord if man's life be such, and the life of my spirit in such things, thou shalt chasten me, and shalt quicken me: behold in peace is my bitterness most bitter. Verso Transcription: me. Sperabam usque ad mane: quasi leo sic contrivit omnia ossa mea. 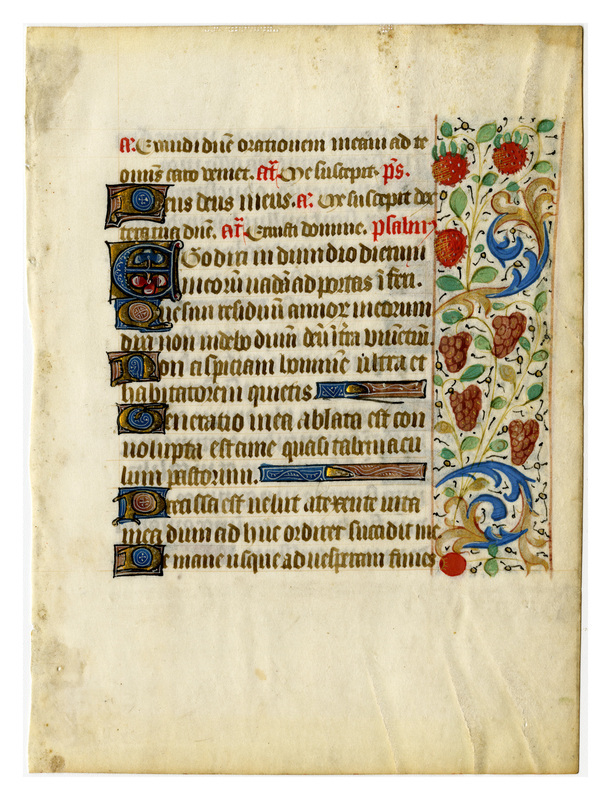 “E0046 Leaf from a Book of Hours (Horæ Beatæ Mariæ Virginis),” Digital Exhibits | Denison University Archives & Special Collections, accessed April 23, 2019, http://exhibits.denisonarchives.org/items/show/66.